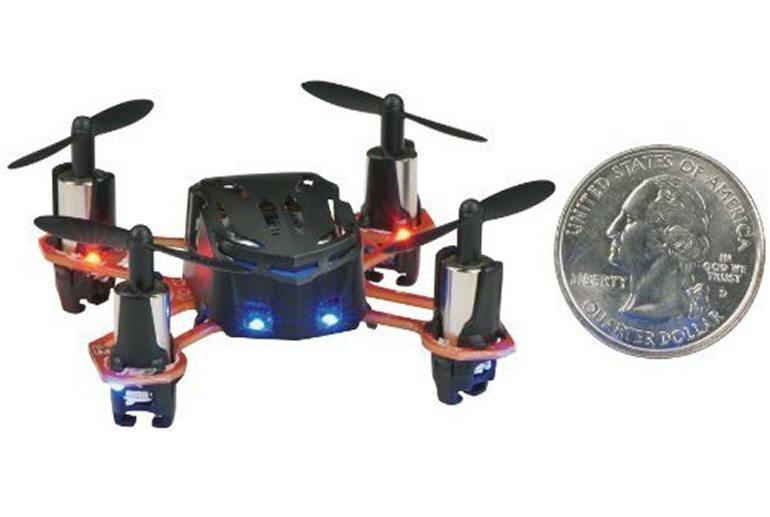 The quadcopter is small enough to fit in the palm of your hand with room to spare. The Proto X is ready to fly out of the box as soon as you charge the internal battery and install the transmitter's batteries. The built-in LED lights are nice and bright. The controller itself is small, which makes gripping the thumbsticks awkward for large hands. 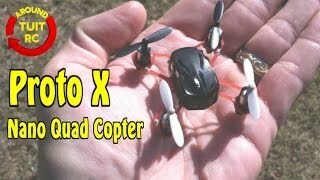 The Proto X only works well indoors; you'd need super-calm conditions to fly outside. The company does not recommend replacing the internal LiPo battery. 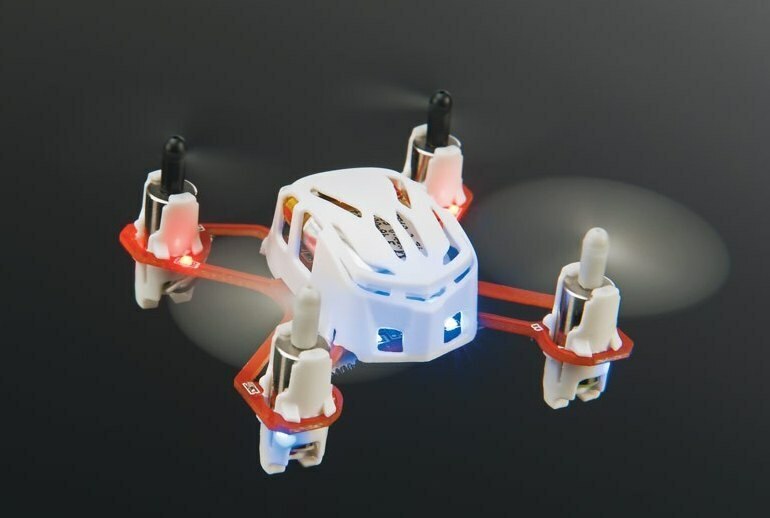 This quadcopter is remarkably small and lightweight. Measuring 1.8 by 1.8 inches, the Proto X Nano weighs just under 1/2 ounce and you can fly it almost anywhere indoors. 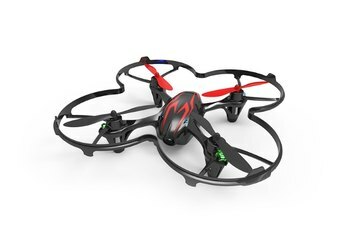 Its 2.4 GHz radio offers interference-free flight, and the bright lights mean you can fly the unit in low-light environments. 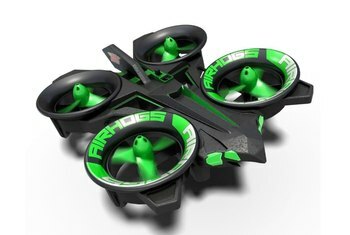 The package includes a 3.7 volt, 100 mAh LiPo battery, a USB charge cord, and four spare rotor blades. You have a choice of six colors: black, white, green, yellow, blue, and red. The transmitter requires two AAA batteries (not included). In fact, just about everything on this little quad would be at home on a larger one, and it’s very intuitive to pick it up and start flying if you’re used to operating a larger drone. Before you know it you’ll be buzzing around corners, looping and diving through the living room, and hovering over the table. There is no camera capability, but that’s not really what it was intended for. 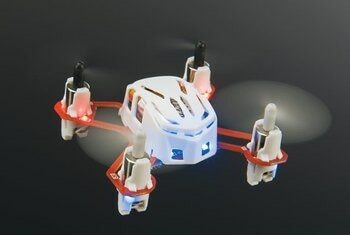 The beginner pilot looking for a cute gadget to fly in the house is guaranteed to have a ton of fun with this mini quad. I initially though this size would be too small and more like a novelty, but after flying it for a few hours I’ve changed my mind on that. This size drone is perfect for casually flying in doors. Its not meant for anything besides that and thats just fine. This quadcopter is SMALL. I mean really small. It fits in your hand with landscape to spare. And it flies remarkably well. Crashing at full speed into walls, dropping straight onto a hardwood floor from as high as the ceiling, and even ricocheting between a chair's legs did nothing to faze it. Charging time varies - reports have been coming in that charging can take from 15 minutes (or less) to as much as 30 minutes. Mine seems to take toward the longer end - maybe 25 minutes. 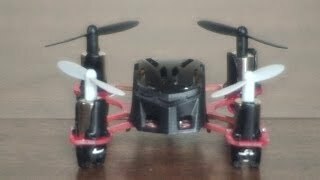 Flying time is about 3.5 minutes, which is quite a bit shorter than other micro or mini quadcopters. 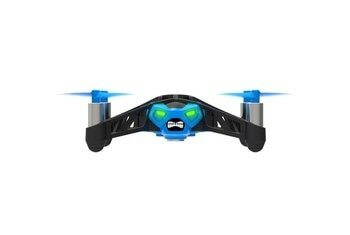 This is not a quadcopter for beginners - that is, it should not be your first quadcopter. The reasons will be spelled out later in this review, but in summary I think most newbies will get frustrated with the short flight times, the difficulty in trimming and other factors. Performing pirouettes and other acrobatics was tricky at first, but only because it was a bit difficult to adjust to the copter’s small size. 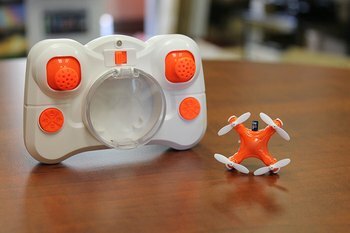 Due to its size and weight, this minidrone should remain indoors. But even so, this super stable quadcopter is blast to fly. [The propellers] fall off very quickly and all accessories are quite annoying to handle. And, for many of us, it will be the ultimate cat toy. True, the small size means limited flight time: Just ten minutes for each charge. But it charges through USB and will quickly be refueled so that you can buzz the kitty again while singing Ride of the Valkyries.